Seen from afar, Australia has always been an unknown territory when it comes to graphic design. Few Australian names are well known outside the country. Older designers may be familiar with figures such as Ken Cato, Garry Emery and Barrie Tucker, but no younger graphic designers have had the kind of international impact that Marc Newson made on furniture or Baz Luhrmann made on art direction for film. In the last decade, few Australian designers have promoted themselves beyond the country’s shores. Stephen Banham, as a self-publisher, is a striking exception. Mambo, with one of the most original graphic identities of any clothing company anywhere, has received little attention in the design press. Designers invited to lecture in Australia often seemed to return with the view that little was happening down under. 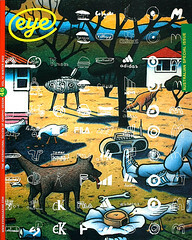 This special issue of Eye has its origins in a disbelief that such a remarkable and fascinating country could be so quiet in a graphic sense and in a hunch that there was more going on than met the eye. In recent years, Australia has emerged as a vibrant contributor to international culture at all levels, with an impact relative to its small population (nineteen million) that other countries might envy. Australian actors and musicians seem to be everywhere. Australian architecture is stunningly inventive; one of the country’s finest architects, Glenn Murcutt, won the prestigious Pritzker Prize in 2002. Australian writers such as Tim Winton and Peter Carey, winner of the Booker Prize in 2001, are held in high regard. Australian film-makers continue to produce some exceptional films, most recently Rabbit-Proof Fence. As Australians never hesitate to tell you, their cuisine is world class, and standards of hospitality are very high. Australia today is an exciting, energetic, hugely stimulating place to visit. Its globally acclaimed staging of the Olympics in 2000 did much to boost national self-belief. Mason was steeped in ideas about type and spatial organisation brought to the US by the European émigrés. He had read György Kepes’s The Language of Vision (1944); the book was a decisive early influence on Emery, too. The young Australian’s other sources included Danish and Scandinavian Modernism – seen in furniture and homewares – European Modernists such as Max Bill and Josef Müller-Brockmann, and Karl Gerstner’s Designing Programmes (1963). Then came Push Pin and Herb Lubalin. As Emery describes it, Australia in the 1960s and 70s was not an easy place to be a designer: it was a self-conscious, laconic, masculine society, shaped by its convict origins and deeply suspicious of anything perceived as intellectual or highbrow. ‘I believe that’s very much part of the Australian psyche,’ he says. ‘It’s a kind of distrust. Maybe it’s not so visible now, but it’s not so long ago that it was highly visible.’ Design was a ‘cissy’s game’ that Emery would only ever discuss with fellow designers and he thinks this anti-intellectualism persists even today. The Australian belief in an egalitarian society goes back to its earliest days and ‘tall poppies’, people who try to stand out above the crowd, have to be lopped to restore equality. This distaste for the ‘self-promotion caper’, as a Sydney-based designer described it to me, is perhaps one reason why Australian designers have tended to be overlooked. Australia, as a landmass, is like nowhere on Earth and nobody who has been to the outback can fail to be deeply impressed – and perhaps even changed by the experience. As literary critic David J. Tacey shows in his book Edge of the Sacred, Australian literature has engaged obsessively and often fearfully with the country’s vast, psychically threatening, unforgivingly harsh and largely uninhabited interior. Only by experiencing a psychic connection with the landscape, suggests Tacey, will Australians learn to respect the ‘mythic bond’ between the land and its indigenous inhabitants. So it’s odd, looking at contemporary Australian graphic design, how little it seems to be informed by a strong sense of place. In my own conversations with many Australian designers, few of them ever mentioned either the landscape or the Aboriginal people, who are so conspicuous by their absence from both the business and practice of design. ‘I don’t think we should necessarily go looking to be regional,’ says Emery, an admirer of Tacey’s work. ‘But if we look inward, then we can discover what is true to the place and create a sense of place and a sense of meaning that is Australian. The visual manifestation of that will be unique.’ For city-dwelling designers huddled on the continent’s coastal perimeter, to embrace the land would be to ‘look inward’ in both senses. Those on the consultancy side inevitably try to cast these developments in a positive light. They say it will lead to better training for designers, greater expectations of customer service among clients and higher standards of professionalism all round. According to one consultant, Andrew Lam-Po-Tang, writing on the AGDA website, another effect might be even faster adoption in Australia of overseas design trends (not that the process seems slow). ‘Once the new ideas land in [an] Australian subsidiary via the internal network, personal networks will take care of disseminating the ideas into the rest of the design community.’ What this would presumably mean in practice is more homogeneity, less regional difference and less chance of a specifically Australian approach to design finding national expression. Many of the most highly regarded practices – the ones people consistently recommend, when asked – employ this stripped-down style: Precinct, with offices in Sydney and Melbourne; Feeder in Sydney; 3 Deep Design and Fabio Ongarato Design in Melbourne. It’s a forgone conclusion that almost any Australian cultural magazine – about film, fashion, architecture or design itself – will adhere to this inflexible dress code. Fabio Ongarato is perhaps the most exquisite and North-like of all in his pursuit of dynamically refined, Helvetica-based layouts that put maximum emphasis on sumptuously art directed photography, often for clients in the fashion industry. Ongarato’s studio is a design temple in the Vignelli mould, with half of the softly illuminated space given over to an entrance / meeting area adorned with classic chairs by Charles Eames and Mies van der Rohe. While much of this neo-Modernist work is undeniably accomplished and projects a seductively fashionable air (at least for the moment), there is nothing specifically Australian about it. The argument is sometimes made that Australia, lacking much of a history, is intrinsically a modern – and therefore a Modernist – country. Wherever this aesthetic is applied, though, even in Europe where it originated, it now looks unimaginative and tired. Anything can potentially happen within the rectangle of the page or screen or billboard, so why default to such a predictable, aesthetically limited and culturally inexpressive range of possibilities? In discussion with Australian designers, it was surprising how many mentioned the old idea of the ‘cultural cringe’ – the anxiety that Australian culture might not match up to standards elsewhere. ‘There is still a lot of cultural cringe,’ says Penny Bowring. ‘There are still a lot of Australians who don’t have confidence in what we produce ourselves and will say that anything that’s international has got to be better than anything that’s local.’ It’s a moot point whether the Australian taste for neo-Modernism is an example of this, or just a sign that in an age of globalisation, everywhere is subject to much the same trends. Other Australian designers pursue paths that seem richer in both local and critical possibilities. Stephen Banham and Inkahoots, a Brisbane-based team committed to socially concerned design, are considered elsewhere in this issue. In Sydney, Advertising Designers Group has positioned itself as an ethical agency, producing carefully honed poster and advertising campaigns that help to raise awareness, cut costs and benefit society, the consumer or the environment. In Melbourne, Studio Anybody started five years ago with the intention of developing an alternative model of graphic design practice. ‘In focusing on concept-driven exhibitions, publications and installations, we hoped to develop alternative communication strategies, learn new skills, stay motivated and make people stop, laugh and reflect,’ explains Lisa Grocott, one of the five partners. Grocott, a New Zealander, teaches postgraduate design at RMIT University and her academic approach to professional practice remains the exception among Australian designers, though it is shared by the other four members of the team. They have managed to combine self-initiated projects with work for the Australian clothing label Mooks, as well as the Melbourne Fashion Festival. The central question for Studio Anybody is to what extent it will be possible to find more hardnosed commercial clients who will permit an exploratory approach. The Dutch designers Armand Mevis and Linda van Deursen have visited RMIT and Grocott compares client cultures in the two countries. ‘When you listen to people like Linda and Armand talk about the way that they can push clients, you want to believe that’s possible here,’ says Grocott. ‘There’s no reason for us to pretend that’s just a Netherlands experience.’ Even so, she confesses to doubts, describing a meeting with a potential client who described a job as a ‘no brainer’ and who felt she was making a potentially lucrative commission more complicated than it needed to be. Talking to Australian designers at all levels, it’s clear that design down under can no more be understood as a single kind of practice than it can anywhere else in the developed world. To compete at a high level for the biggest clients will require an increasingly focused approach, especially with the arrival in force of the global branding factories. ‘We have to be serious about our businesses and we have to have something to offer, otherwise they’re not going to take us seriously,’ insists Ken Cato. There is no way that the smaller or even medium-sized local design teams will ever be able to outdo the globals, so perhaps the answer, as elsewhere, lies in a different strategy – locating the overlooked gaps and occupying them. This is what the most far-sighted and promising designers are doing. The future of Australian design, as an exploratory cultural practice, will depend on the success with which committed designers are able to prise open these spaces, negotiate relationships with sympathetic collaborators and offer alternative forms of culture that the big guns simply don’t grasp.